Samsung’s sure to make a big splash with the Galaxy S9 early next year, but it also has a new mid-ranger on the way, in the form of the Samsung Galaxy A5 (2018). We know it’s on the way because Samsung has posted a support page for the phone on its South Korean website. Or rather, it’s posted a page for the SM-A530, but given that the Samsung Galaxy A5 (2017) has the model number SM-A520 and the Galaxy A5 (2016) is the SM-A510 there’s little doubt that this is the Galaxy A5 (2018). Sadly, the support page for the unannounced model doesn’t currently have any information on it, but some rumors have already circulated. GalaxyClub.n,l for example, has recently found evidence that the A5 (2018) will have an 18.5:9 display, which is the same ultra-widescreen aspect ratio as the Samsung Galaxy S8. And prior to that Android Authority reported that the phone would have a 5.5-inch Full HD+ display, 4GB of RAM, an Exynos 7885 or Snapdragon 660 chipset, dual front-facing cameras and a water-resistant build. We’ve also heard that the next phones in the A range will get Samsung’s Bixby assistant. Of course, none of this is confirmed yet, but we should know the final specs of the Samsung Galaxy A5 (2018) soon, as its predecessor was announced in January 2017, so the new model could be just a couple of months away. 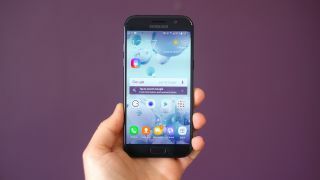 Hopefully it will improve on the Galaxy A5 (2017), which we gave four stars to in our review, praising its battery life, build quality and OLED screen, but noting that its CPU could be better for the money.